Correction: A previous version of this article misidentified the law school where Professor Robert Stein was dean when Sara Jones and Leon Trawick were students there. Stein was the dean of the University of Minnesota Law School at that time, and Jones and Trawick were students there. The move to an office suite in Mondale Hall, which began this week, is part of a plan by the organization to expand its service to the wrongfully convicted, both programatically and geographically. Buoyed by a grant from the Lakeshore Foundation last year, IPMN has expanded its staff from two to four and has established goals to advance its presence in North Dakota and South Dakota. After Hamline School of Law and William Mitchell College of Law merged in 2016, IPMN’s legal clinic moved to the current Mitchell Hamline site. The school lacked the office space, however, for IPMN itself, and Jones said exploratory discussions about a move to the U of M began shortly thereafter. The talks grew more serious last fall after Jones joined the organization in August. Jones recalled that board member Leon Trawick suggested meeting with professor Robert Stein, who had been the dean of the University of Minnesota School of Law’s dean when she and Trawick were students there. Stein arranged for the three of them to meet current U of M law school dean Garry Jenkins, and after a few months an agreement was reached. Although its new office will be at the University of Minnesota Law School, IPMN will remain an independent nonprofit organization, with its own staff, board of directors, and financing. In addition, IPMN will continue its Innocence Clinic at Mitchell Hamline. According to IPMN’s litigation director Julie Jonas, part of the desire to be physically connected to a law school is simply to be close to students—because they provide the necessary manpower in terms of screening and investigation of cases and potential cases handled by IPMN. 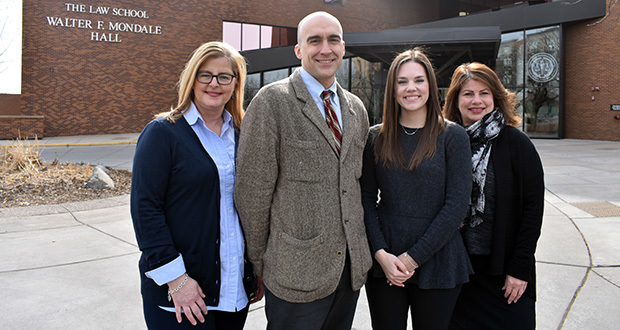 The grant from the Lakeshore Foundation has allowed IPMN to hire its first staff attorney, veteran lawyer Jim Mayer, and advancement and operations manager Emily Luxem. In addition, IPMN intends to hire a second staff attorney later this year. The addition of Mayer—who has practiced law for 15 years and has devoted some 3,000 hours of pro bono work on death-penalty, post-conviction, and asylum cases—will allow IPMN to better handle its backlog of current cases. According to Jones, IPMN now has seven cases in which the organization and its volunteer lawyers are representing people in various stages of litigation another 30 that are open in screening and investigation and another 13 that are awaiting screening. For Jones, Jonas and Mayer, the move to the U of M marks a homecoming of sorts—all are U of M Law alums. For Jones, in particular, the move has special meaning because her father, the late C. Paul Jones, had an office there as Minnesota’s first State Public Defender from 1966 to 1990 and also was an adjunct professor there. Julie Jonas, who oversees all of IPMN’s litigation, sees the move to the U of M as a special opportunity to strengthen the organization’s work. Editor’s note: An earlier version of this story erroneously stated that Robert Stein was dean of Hamline Law School and that Sara Jones and Leon Trawick were students there. They were all at the University of Minnesota.